Apparently, the Shredder has issued a challenge for a one-on-one duel to see who controls Manhattan. 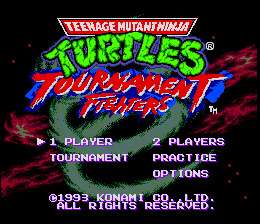 In Tournament Fighters, the Teenage Mutant Ninja Turtles have a contest to see who gets to face Shredder in the ultimate show-down! Joining the tournament are, of course, the four Turtles, plus April O'Neil, Casey Jones, Ray Fillet, and Sisyphus. TMNT: Tournament Fighters is a well-designed and well-made 2-D fighter. The characters and backgrounds are very detailed, and the animation is nice and smooth. Also a good variety of characters, and different moves for each character. If you're a fan of fighting games, or of the Turtles, give TMNT: Tournament Fighters a shot!